Make the custard first. Blend custard powder, sugar and milk in a saucepan. Stir constantly over low heat until the mixture boils and thickens, then stir in the butter and vanilla. Allow to cool. Spread half of the cake batter into a greased and lined cake tin. Then spread the custard mixture. Spread the remaining cake batter over the top. Bake for about 35-40 minutes, depending on your oven. Allow the cake to cool in the pan. Once the cake is cold dust it with icing sugar. Thanks for stopping by, have a good day! Hi love, me too saw this cake in so many blogs already.Mayb its abt a time to bake it my self. yummy delicious and marvellous cake. Even I had tried this cake long abck...its awesome isn't it :)..looks delicious! 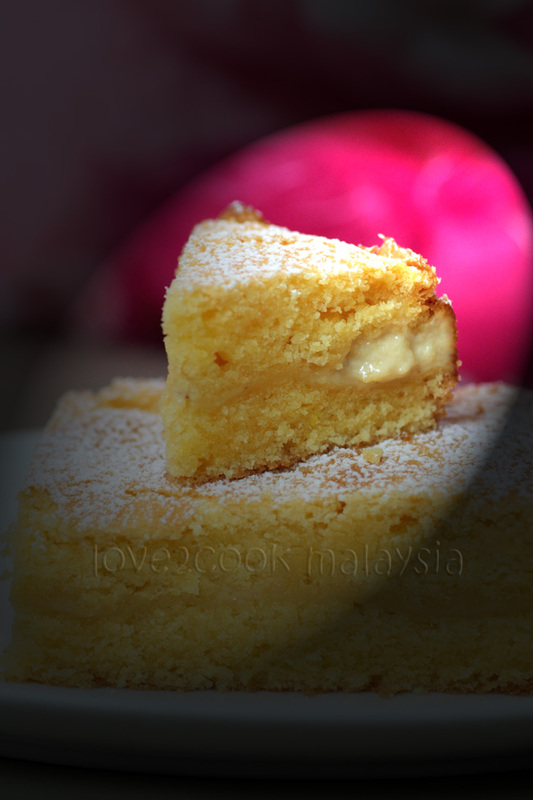 love, mas suka sangat kek ni..
Beautiful tasty clicks.Nice moist texture must have tasted superb. Gorgeous Cake,love this with a cup of tea...very tempting clicks. 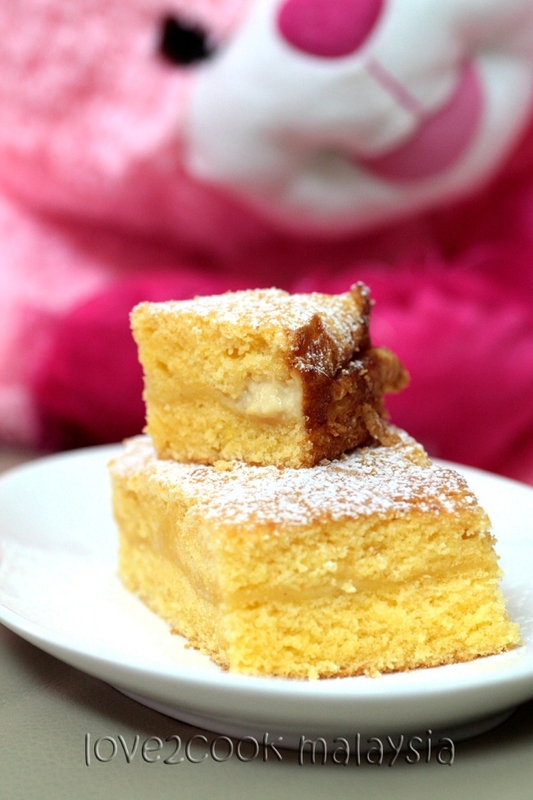 Spongy and yummy looking cake... 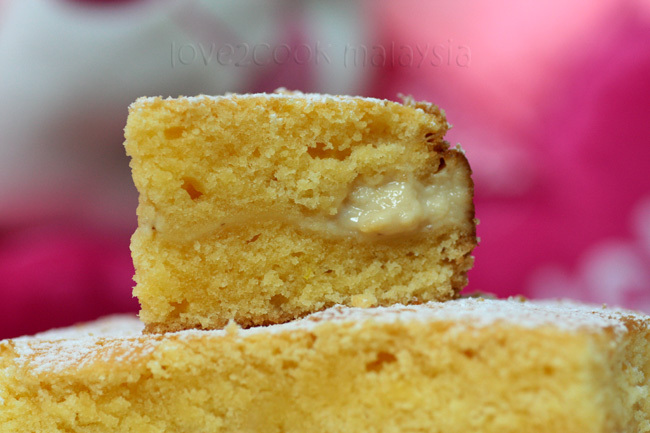 Loved the filling... Will try this soon..
soft n spongy cake...looks perfect. OMG i am seriously drooling over this cake .. very very tempting.. love the texture I am bookmarking it. Lovely cake, looks simply superb. Moist and yummu cake..Loved it. 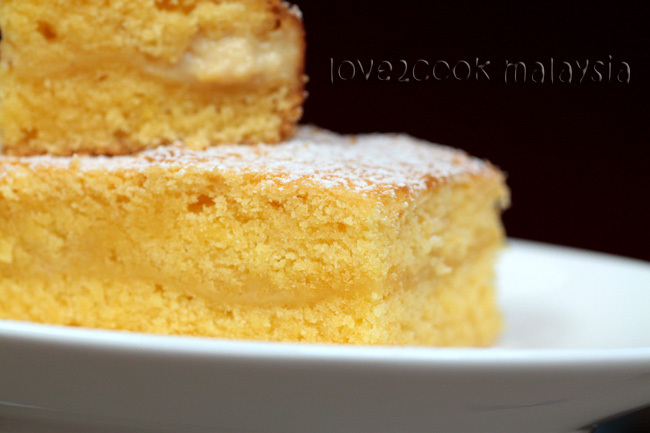 wow....custard cake looks so delicious dear !I was thinking of making custrad cake for some time...thanks for sharing the recipe !ur presenatations and clicks are just so awesome ! Cake looks absolutely divine, cant wait to try this cake,irresistible..
OOO, that sounds delicious! The pics are sensational! It looks really delicious! Love the custard in the centre. I would go with black coffee with this! Two slices please! Congrats, you now have join the rest. Such a wonderful taste, I can still taste the custard until now. Will bake again one day. This looks fabulous! I would love to serve this after dinner tonight. What gorgeous clicks! Love the color and the perfect texture of the cake. Superb cake. Love it. Must try. Lovely pics too. Unbeknown to me the computer speakers were on while visiting your site. I was delighted to hear the beautiful music playing in the background. What a lovely touch for your viewers. It simply added to the whole experience as I drooled over your cake with all that luscious custard oozing out. 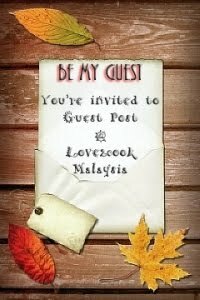 just passing by...u hv beautiful kids..hv been keeping the recipe for quite sometime now but hv no time to bake it yet...but yr photos looks so tempting with the custard just sticking out...will try it maybe this weekend! I tried it and turned out real nice!! Texture juz like suji cake. 3/4 of the cake gone in 30 mins. Thanks love for the wonderful recipe! 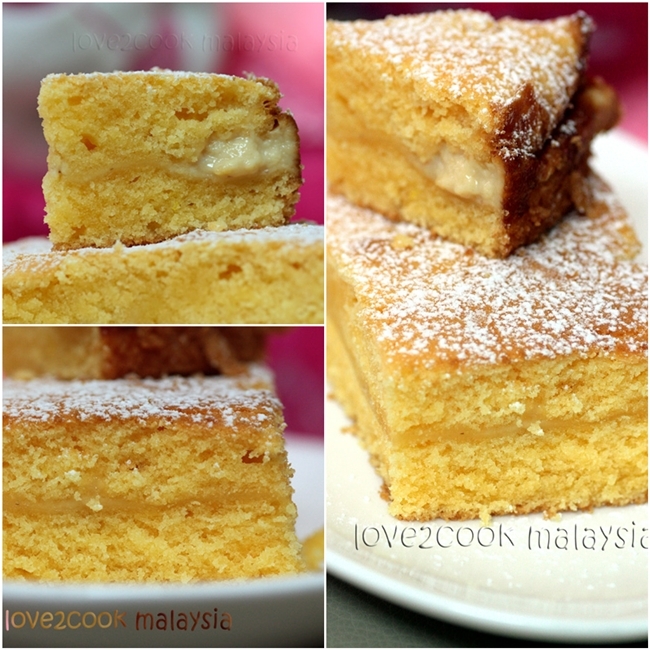 hi there.. superb recipe n yeah i've tried it today and it turned out so well ! will the mixture of custard is supposed to be hard and sticky like jelly form or a lil bit of liquid form. I tried but it was kinda hard and sticky on the sauce pan ..
is that the way it should be ? Yes, the custard mixture will thicken and becomes little hard. That's why it needed to be cooked over low heat. Once the butter is added, it should not be that hard.